Challenge your party to keep their weight balanced as they race to the top of the ladder climb. Try if you can to Climb the Ladder. Also known as Jacobs Ladder Inflatable at carnival game booths. 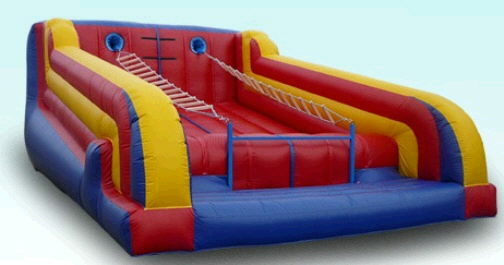 This inflatable is a challenging attraction that always draws a line of eager participants wanting to test their skills. Whether riders challenge themselves individually or turn it into a race, Climb the Ladder is a fun game for everyone to try over and over again. The surface is 22 x17 inflated and has plenty of room to catch the contestants as they teeter off the ladder. The sides are also covered to protect riders from rolling off the ride. * Please call us for any questions on our ladder climb dual 22x17x9 foot tall rentals in Ft. Wayne IN, Warsaw, Syracuse, Auburn, South Bend, Indianapolis IN.